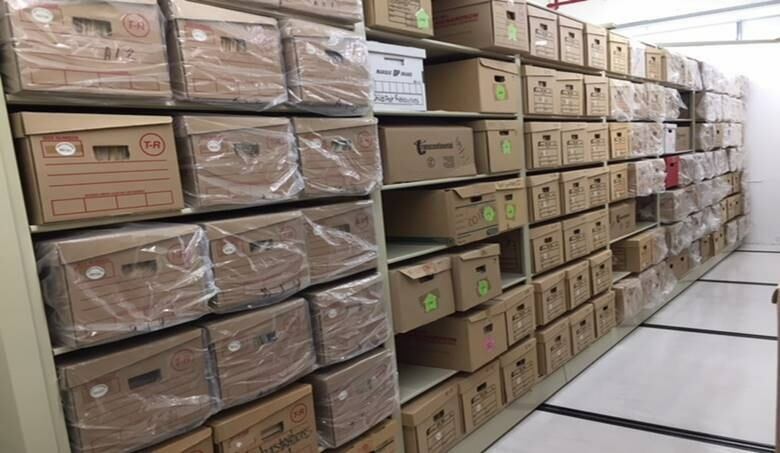 The Council of Yukon First Nations has begun a project to examine and organize its thousands of boxes of historic photos, videos, tapes, and documents. Grand Chief Peter Johnston has barely scratched the surface, but what he's seen so far of the Council of Yukon First Nations' (CYFN) archival records is "incredible," he says. "Almost 100,000 pieces of audio, print media, pictures ... it's just a treasure waiting to be seen," he said. "It's one of the best things I've been involved with, in my life." The materials go back decades, and trace the modern political history of Yukon's First Nations. There are 1,782 boxes at the Yukon Archives storage vaults in Whitehorse, and most have been sitting untouched for years. Now, CYFN plans to go though everything and figure out what's worth keeping and how it should best be preserved. That may involve digitizing photos and slides, transcribing audio recordings, and devising a cataloguing system. "It actually has all the history for the last 50 years of the Council of Yukon First Nations, from the negotiation processes, to native grads, to community visits," Johnston said. "We have the signed copies of the [Umbrella Final Agreement] — all these things that are, like I said, so precious to our journey so far." In all there are 1,762 boxes in storage, and most contain documents. The other boxes contain about 14,006 photos, 4,529 slides, 72,119 photo negatives, 900 films and videos, and 2,850 audio tapes. "There was a shed in the back that all this information was stored in, along with the lawnmower and gasoline, and so it was very vulnerable," he said. The records are not accessible to the public — yet. One of the goals of the project is to organize everything so that the materials can be effectively used, while preserving things that tend to deteriorate such as audio tapes. "We want to give this information back to the First Nations so they can start utilizing it within their own governments. And like I said, this is our curriculum, if you will, when it comes to 'Yukon First Nations 101,'" Johnston says.